Via Von: Girlie Girl and Bling Things! I belong to several FaceBook artistic groups and as is to be expected, sometimes members cross over from one group to another. Lorrie Weber is one of those wonderful people whom I've been privileged to meet through the art aMUSEment group and her own group Craft Stash (where you can sell gently used art supplies). I've never done an ATC card before today, but spent a week or so researching them so I could get a better understanding of what they were all about. This is what I came up with. Scrapbook paper, including a bit of Susan Winget's small book of paper (whose designs I adore! ), some of it punched with a hearts and scrolls border, cloth flowers, opalescent gems on the bottom and pearls defining the bird area. It's not quite geared for a little one, I fear, but am hoping she'll like it well enough anyway. This little book has 8 pockets and is slightly larger than an ATC Card. 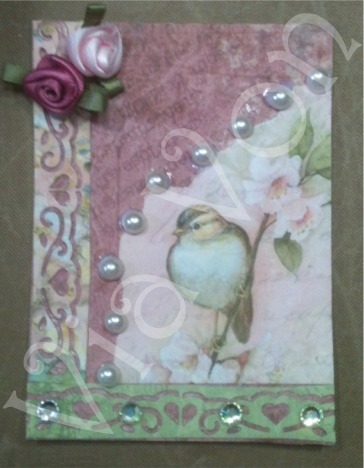 It will hold 8 ATC Cards as long as they are not overly embellished. 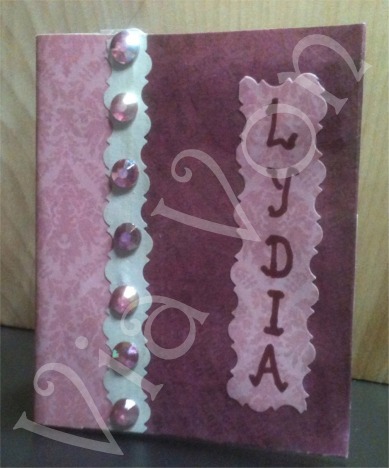 This one is, again, made of scrapbook paper and glue with added gems on both front and back for a little bit of bling. I will set this behind the ATC Card and tie them together with a pink ribbon.